Mock’s Vane | The Cesspit. “Mock’s Vane” is the object whose description opens the Prologue of Gardens of the Moon. I was briefly discussing its description on Westeros forums when I noticed that on Tor reread it was interpreted in a completely different way, without triggering any debate. So I thought it was worth elaborating here. Hardly a cheery start, but an appropriate one. I like to think of that vane as synonymous with the Bridgeburners: their armor also rusted and stained (albeit with real blood), balancing atop a sharp point (between loyalty to the Empire and defiance towards the Empress), hammered into its current shape by a cruel forging, and buffeted by the winds of war and politics. It makes sense but I think my interpretation is more accurate and convincing. I’m not a particularly intuitive guy and these things usually defy me, but in this case I used a rather simple framework. I took the object and divided its basic qualities. Those traits will probably qualify what the vane stands for/symbolizes. As to say “a century old”. It already defies the Bridgeburner interpretation as the Bridgeburners were most likely created much later. This particular vane is then featured again in “Night of Knives”, the Esslemont book. It appears twice, once at the beginning and once at the end of the book. On its pike at Temper’s side, Mock’s Vane, the winged demon-shaped weathervane, shook and hummed as if caught in a steady gale. Temper frowned at the old relic; the winds were calm this evening. Down the wall, Mock’s Vane stood silent on its pike. Temper eyed it – the damn thing appeared frozen athwart the wind. 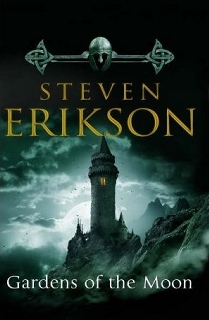 The main reason why I criticized this book in my review, is that Esslemont is like Erikson stripped of all subtlety and we see a good demonstration in those two quotes. The symbol is stripped of ambiguity and reveals its meaning all too plainly: the vane moves, without wind, at the start, and is still, even with wind, when the night is over. Why? 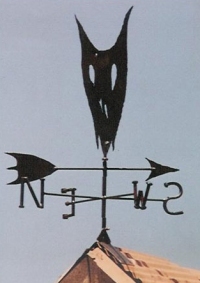 Because its symbolic meaning is more important than it being a weathervane and so pointing the direction of the wind. “Night of Knives” is the book with the story of the night that the Prologue of Gardens of the Moon anticipates. Mock’s vane is there to represent the old empire under Kellanved. Its description and physical properties are “thematic” and analogous to that sort of empire he built. The vane is restless because a convergence is close (but the reader doesn’t know this yet), in Night of Knives it moves before the convergence, then stops when the night is over. Mock’s Hold, in Erikson’s own words, represents a position of power and control, in this case it “observes” from above. An old thing stirring. An emperor that comes back. A misshapen, grotesque imitation of life (movement). There are lot of things and meanings packed there. In just a few lines. All the various meanings are directly connected with the prologue and what the prologue stands for (the “Night of Knives”). It works really well because it is coherent with everything Erikson wanted to do with that Prologue. You can accuse it of being maybe too plain and obvious, but here we got that piece interpreted in a different way, or considered by other readers as being pointless or not having any real meaning. From a side Erikson is accused of being too obscure, and when instead symbols are more obvious then he’s accused of being too plain. One has to consider in particular how that part is approached by a reader. A first time reader doesn’t know what is about to happen, doesn’t know what happened to the emperor. One doesn’t know the rules of Ascendancy and gods can be only considered on a level that is entirely separated from human affairs. This “disconnection” allows Erikson to do some of the most obvious foreshadowing and brilliant sleight of hand. Things are spelled so clearly and yet the readers are so masterfully deceived. The vane can only be registered as ominous foreshadowing that can’t be placed yet (and that aspect was well commented by Bill). Its real meaning isn’t even revealed if one reads the whole book because what happened that day is the apex of a long story involving the matters of the “old empire” and “old guard” that the reader pieces together in the longer term. It takes maybe up to House of Chains to get the whole picture. Good foreshadowing = when some vague hint acquires a much greater import in retrospective. And in that, Bill’s interpretation is actually incorporated by the greater one. The Bridgeburners are caught in bigger situation and just one of the parties involved. That day, foreshadowed by the vane stirring, has a much bigger impact. And so, depending on the level of awareness of the different reader, it adapts its meaning.